It is the season for red roses, wine, romantic proposals and status updates that over share. Valentines Day for people who have had bad experiences in love, those who are newly separated, those who are disappointed, those of us who feel misunderstood and those who feel invisible, can be one of the loneliest days of the year. I remember, year after year, every single Valentines Day after another, I had a sneaky little hope that a card may just appear in my mail box, but that long walk down the drive always deferred that hope and made my heart feel a little sick. Valentines day, for those without a beau can be really confronting. How do we celebrate love corporately without alienating and increasing the difficulty of the day for those who are partnerless? My hope is that we would make one another feel beautiful. That as a sisterhood, we would notice the single mum at the school gate and write a little note of encouragement telling them how truly amazing she is. That as women, we would notice the widow, who has lost her partner, and acknowledge her pain and comfort her with a love package, a bunch of flowers, a phone call. That as a friend, we would not pity the single people in our worlds, but empower, encourage and acknowledge their places of pain. A card, a meal, inviting them out, taking them on a date to the movies. That the need inside of every woman, to be acknowledged, noticed, feel beautiful and loved would be met. That those needs would be met by a community surrounding that cares. That those desires would be embraced and we would corporately notice those who find themselves alone this year. 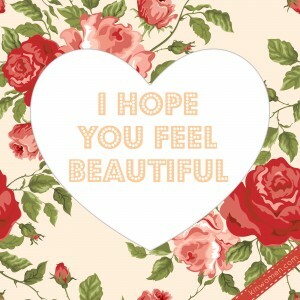 My hope is today, that no matter where your relationship status lays, that you would feel beautiful. Adored, Loved, Noticed, Connected with. Even though I don’t know you, I am thinking of you today. You have a lovely, loveable and loving heart.